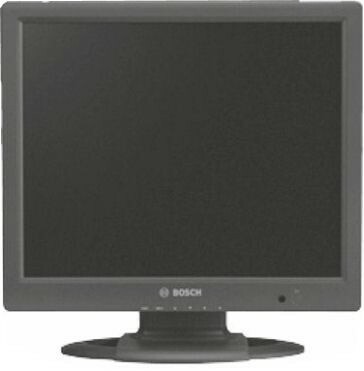 The Bosch LCD flat panel monitors are high-resolution colour monitors ideal for use with analogue video, digital video recorder (DVR), and PC applications. The monitors feature a colour liquid crystal display (LCD) flat-screen panel and are available with 15-in., 17-in., and 19-in. viewable picture areas. Each monitor also features a wide range of horizontal and vertical viewing angles that provide comfortable, clear viewing – whether you place it on a desktop or mount it to a wall or in a rack. Bosch LCD monitors automatically adapt to the input resolution of the incoming video signal (up to 1280 x 1024 pixels or 1.3 Megapixels). The monitors' analogue VGA input easily accommodates the widespread use of PCs in today's security surveillance systems. Their high contrast ratio (600:1 to 1000:1) and high brightness rating (250 to 300 cd/m2) offer excellent colour accuracy and imaging for easier viewing and interpretation of images. The panel refreshes every five to eight milliseconds, so you get crisp, clear images with less smearing - and less image “ghosting” in fast-motion video. Long-life fluorescent backlights help avoid luminance degradation on the LCD monitor – so it easily maintains its brightness level over time. This is an advantage over aging CRT-type monitors that become progressively dimmer. The consistent brightness also provides a sharp display image, without the constant flickering that you typically see in CRT monitors. This allows you to use the LCD monitor longer without eyestrain or excessive fatigue.